Welcome to this, the final one of my detailed write-ups from this year’s London Coffee Festival. So far I’ve written about sustainability, kit & cups, and my coffee experiences, as well as kicking things off with my traditional festival round-up. Today I’ll end as I normally do, with a discussion of the actual coffee. Plus a few other random items. I’ve never yet been to a coffee festival where I’ve managed to visit all the roasters I’ve wanted to and this year was no different, so apologies to everyone I missed. This year was a bumper one for smaller roasters, with the London Coffee Festival building on the introduction last year of the Roasters Village, with an expanded version this year. Indeed, it was so big that it had to be split into two: north (which was upstairs) and south (which was downstairs). As before, I’ll start with introducing you to some old friends, roasters who are well known to the Coffee Spot, before moving onto all the new roasting friends that I made at the festival, then some of my coffee highlights. I’ll end with a round-up of all the food on offer, including the excellent White Label Kitchen. You can meet some of my old friends after the gallery. Normally I’d start with my friends at Allpress, where I had my first coffee of the festival, but this year, in an interesting twist, the team at Allpress were encouraging you to make your own coffee, so that’s what I did, writing about my experience in one of my previous pieces. I also popped in to see old friends, The Roasting Party, where I got some latte art lessons from Dhan of the Coffee Lab, which I’ve also reported elsewhere. Other old favourites were there, including Union Hand-roasted (which hosted its annual taste challenge), Caravan and Taylor Street Roasted. The Roasters Village was well populated with the likes of Horsham Coffee Roaster, London’s Volcano Coffee Works, Bristol’s Clifton Coffee Roasters and Brighton & Hove’s Small Batch. Talking of the Roaster’s Village, Leeds’ North Star Coffee Roasters had a stand in the upstairs part. One of my favourite roasters, things are moving along a pace for North Star, including a new roastery (well, not so new now) and a very new coffee shop, which has just opened in Leeds! At the festival, North Star was showcasing its new ‘Spotlight’ range, designed to some standout coffees. To go with the standout coffee, there’s a new range of standout packaging, with the packet’s sleeve made from recycled coffee cups, something which I approve of! North Star is also looking at recycled coffee bags or, ideally, fully compostable coffee bags, something which the industry is finally waking up to. The coffee itself was an Ethiopian Ambela, a washed coffee that tasted superb in the cup. Sometimes I have problems with Ethiopian espressos, but this was wonderfully smooth. Talking of espresso, I had a chance to catch up with Dan Fellows on the Origin stand, next door to North Star in the Roasters Village. I’ve been sampling Origin’s coffee on a regular basis this year with visits to its stores in the British Library and Euston Road, so Dan had to twist my arm to get me to try the San Fermin espresso he had on the stand. This washed coffee was another beautifully smooth cup that went down a treat. However, it wasn’t all espresso. I popped downstairs to see my old friends at the Climpson & Sons stand where Henrik had a sample of a batch-brewed Cerro Azul Colombian Geisha for me to try. This was a very fine cup indeed, with great body and subtle flavours. Henrik, who I’ve been nagging for several years about the lack of decaf at the festival, also had a bag of Climpson & Son’s single-origin Ethiopian decaf for me, which was nothing short of awesome. I had it both at home and on my travels in Japan, and it was amazing. I’ll leave you with another filter, this time from Grumpy Mule. This was another washed coffee, this time from Guatemala, a very clean, smooth cup, and an interesting contrast to the Colombian. You can meet some of my new roasting friends after the gallery. Traditionally, coffee festivals are a great way to meet new roasters and try new coffee. Although I’ve since been to its coffee shop in Leicester, the festival was my first introduction to St Martin’s Coffee Roasters. I caught up with St Martin’s head-roaster, Ole, who was celebrating the move to a new dedicated roasting facility. I tried the Friday St blend, a fine, well-balanced espresso which, as I discovered when I had it as a flat white in Leicester, goes just as well in milk as it did on its own. St Martin’s also roasts a range of single-origins, Ole letting me have a bag of a Costa Rican, while I’ve just started on a very juicy Kenyan that I was given in Leicester last week. Just around the corner from St Martin’s in the southern outpost of the Roasters Village was another new (to me) roaster, Exeter’s Crankhouse Coffee. Crankhouse has been going since 2014, roasting on a 1995 Petroncini TT7.5 and it’s high time I popped back to Exeter and said hello, although when that’s going to be is anyone’s guess. I had a very fine washed Ethiopian espresso, a well-balanced coffee that went down very smoothly. It was definitely a festival of well-balanced coffees! From Crankhouse, I moved upstairs (literally) to the northern outpost of the Roasters Village, and, in so doing, metaphorically crossed from west (Exeter) to east (Margate) to visit Curve Coffee Roasters. I already knew Curve’s coffee from the wonderful Federation Coffee in Brixton, where I enjoyed Curve’s bespoke Stardust espresso blend, also taking a bag of it home with me. I didn’t try any of Curve’s coffee at the festival, but it was great finally meeting owners Jon & Tereza. Talking of interesting espresso blends, I found time to catch up with Redemption Roasters, an interesting outfit with a roastery in an actual prison. Not a decommissioned prison. A working prison, in Aylesbury. Redemption Roasters works with young offenders at the prison, training them in both roasting and barista skills, the idea being to equip them for work in the coffee industry once they have been released. Redemption’s gone one step further and opened a coffee shop in London. I tried a shot of the signature 1847 blend (the year the prison was built), another rich, full-bodied espresso. I also got a bag of one of its single-origins, a washed Rwandan, to take home with me. Although it’s a social enterprise, Redemption Roasters isn’t a charity. Instead it’s a full commercial operation. Finally, as a fan of decaf, and having long decried the lack of decaf at the festival, I was pleased to see Swiss Water Decaf at the festival. Swiss Water is perhaps the best-known decaffeination process, with the company, which is based in British Columbia in Canada, sourcing and decaffeinating its own coffee, as well as providing a decaffeination service for other roasters and green bean importers. Various decafs were on offer throughout the weekend. I tried a lovely Guatemalan decaf from Grumpy Mule, an interesting contrast to the caffeinated Guatemalan I’d tried on the Grumpy Mule stand. However, perhaps the most interesting came from South Africa roasters, Truth Coffee, a very drinkable Colombian single-origin. You can see some of my festival highlights (coffee-wise) after the gallery. 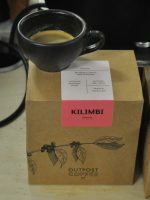 Let start with old friends, Outpost Coffee Roasters of Nottingham, who were down at the Roasters Village (southern branch) with a Kilimbi, a naturally-processed coffee from Rwanda, which made a change from all the washed coffee I’d been drinking. Harley, a barista I’d met at the Outpost Coffee café last summer, was brewing some up as a pour-over and, I have to say, it was sublime, a full-bodied coffee with chocolate notes, which I don’t normally get in pour-overs. It was easily my favourite filter coffee of the festival. Later on, Harley came to find me since he wanted to tell me that as well as the filter roast, there was a small amount of the Kilimbi that had been roasted for espresso. Intrigued, I popped back the following day to try it and, I have to say, it was just as sublime as an espresso. A smooth, well-balanced coffee, it was easily the most complex espresso I had at the festival, the espresso roast bringing even more flavour out of the coffee than the filter roast. Talking of complex espressos, old friends Frank and Earnest Crafted Coffee had taken a stand in its own right this year, which was chock full of cold brew. Bottles and bottles of the stuff. Fortunately, Frank and/or Earnest (not their real names) know that I prefer my coffee hot and had brought along an espresso machine and a single-origin Kenyan. I’ve long been a big fan of Frank and Earnest’s Honduras single-origin espresso, so I was keen to see what this new one tasted like. As an espresso, it was okay, but a little too bright for me, something I often find with Kenyan single-origin espressos. However, someone thought to try it in milk, which was genius. The milk really lifted it, taking the edge off the brightness, producing a really sweet coffee, with toffee-like notes. Sublime. Finally, in this round-up, let’s say hello to old friends, Volcano Coffee Works. Once again, I’ve long been a fan of its Full Steam espresso, a single-origin Peruvian coffee. However, while that was on show upstairs in the Roasters Village, Volcano was downstairs under the guise of Volcano at Home, launching its range of nespresso©-compatible pods. As regular readers will know, I was initially sceptical but was quickly converted to the idea. These days I am always on the lookout for new speciality coffee in pod-form. Volcano’s main claim to fame, other than to roasting some great coffee, is that its pods are 100% compostable. At this point, in the interests of transparency, I should note that I wrote the copy for the new Volcano website. I was therefore doubly interested to try them out at the festival, having not had one before. Up until now, I’ve largely viewed pod coffee as something separate from espresso, a longer drink, somewhere between espresso and filter coffee (in that respect, not unlike Traditional Vietnamese Coffee). After the gallery, you can see what I made of the food at the festival, the final part of my final write-up this year. I’ll leave you with an often-overlooked element of coffee festivals: the food. This year, the mainstay, the White Label Kitchen, was joined by a pop-up restaurant from Grind. This year, Grind was offering a coffee-and-food pairing experience, but this required pre-booking. Of more interest was an all-day brunch menu, which I made use of on Sunday morning. I couldn’t resist the avocado and poached eggs on toast, to which I added some feta cheese and a flat white. The food was excellent, as good as I’ve had in any of Grind’s coffee shops, while the coffee got my day off to a great start. I’ve been critical in the past about the White Label Kitchen, particularly when it was dramatically cut back a few years ago. However, the London Coffee Festival does listen to feedback and this year the White Label Kitchen was better than ever. It’s retained its dedicated space upstairs at the back of the Shoreditch Zone, with its own seating area. Once again, there were four options, but this year there was a lot more vegetarian food, including one stand that was completely vegetarian and one that was all sea-food. Vegans also seemed well catered for. I made great use of my perennial festival favourites, Arancini Brothers. Arancini Brothers made its name with handmade risotto balls, which have been a staple of mine at the London Coffee Festival over the years. Sadly, this year, the risotto balls weren’t on the menu (I asked, and was told it was part of moves to streamline the service, something which, given the queues, I can appreciate). Instead I had my other favourite, The Mickey, a mushroom and courgette veggie burger which was nothing short of awesome. Arancini Brothers’ food has always been good, but this one was the best yet! Of course, as much as you need breakfast and lunch, where would you be without cake? I visited my old friends, Cakesmiths, who kept me liberally supplied with cake throughout the festival (plus some to take home at the end). I adore Cakesmiths’ banana bread and the smashing pumpkin seed loaf, but this year, Mike, Cakesmiths’ Cake Inventor (yes, that is his official job title), had a new treat for me: a Moka & Walnut loaf. It had a rich muscovado sugar taste to it, with subtle hints of walnut: quite wonderful. And talking of wonderful, I also indulged in a slice of the coffee cheesecake brownie, which is absolutely as awesome as it sounds. Coffee, cheesecake and brownie, all in one slice. Heavenly. And talking of heavenly, it wouldn’t be a London Coffee Festival without old friends, Kokoa Collection, fulfilling the dual roles of hot chocolate provider and left-luggage locker. However, I’ll leave you with a non-food related item. Toccami has a range of interesting merchandising, including cups and saucers, but what caught my eye were the engraved slate coasters, which you can buy on-line, choosing from a range of Toccami’s own designs or you can design your own. Watch this space. Well, that’s it for this year. Don’t forget that the London Coffee Festival is back at the Old Truman Brewery next year from 12th to 15th April. For other perspectives on the Festival, check out the following reviews by Jenny Ferreira, Bean There At, Bex, Audrey Fiodorenko and the Commodities Connoisseur. For a slightly more quirky take on things, here’s an interesting article from Sprudge and for a more food-orientated look at things, here’s MiSU’s take on the festival. If you’ve written a review of the festival, drop me a line with the link and I’ll add it in. This entry was posted in Coffee, Festivals/Awards, Inner London by Brian Williams. Bookmark the permalink.